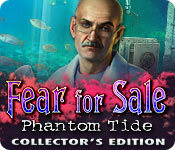 Fear for Sale: Phantom Tide Collector's Edition is rated 3.7 out of 5 by 46. Rated 5 out of 5 by rosekaufmann from FUN ADVENTURE GAME SUMMARY: Love the Fear for Sale games. I privately grade my games and they are always in the top 10%. They are fun to play, well thought-out, flow effortlessly, colorful and have excellent sound/special effects. STORY: You play Emma Roberts, called to investigate paranormal water-based anomalies in Greenville. Water is everywhere, even flowing up the walls in the White household. 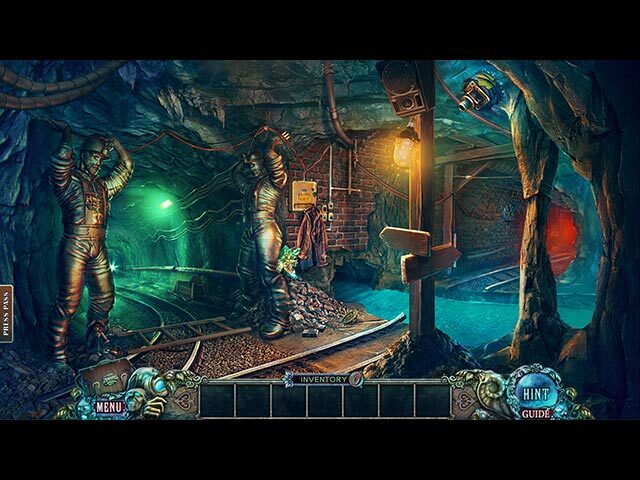 GAMEPLAY: Mostly adventure game. You have a shell which is used to manipulate the water; realistic sound effects; fantastic visual effects; pleasing bright color palettes; and music to help push you suspensefully along in the appropriate places. Good voice overs. You can customize your level of difficulty (4 total modes). HOS are fairly crowded, but colorful and distinct. Objects are easy to find and some are interactive, requiring more than one action. You can play a jigsaw puzzle if you don't want the HOS; but the HOS are so nice, I can't imagine not wanting to play them. Puzzles are plentiful as you try to figure out what to do and where to go. One improvement could be the hint system. It is just not very helpful. Example: fairly early in the game, you come across a raining door which needs 3 objects to open it. If you need help to find one of them, the hint will point out the door. Well duh! I already know I have to put something there - the question is what and how can I find it? CE has 12 collections of 5 pieces each, a number of achievements, and the usual extras. No morphs, but it has enough collections that I will buy the CE instead of the SE. Rated 5 out of 5 by Powrtoc1 from The only normal water behavior was in the fish tanks Storyline was quite unique. No much of a twisty-turny mystery story, and the HOS were predictable, but it was a fun game to play. What was funny was the little girl's calm demeanor as the water phantoms took over the house. Good game for beginners. Rated 5 out of 5 by Kimmycoo from FEAR is FANTASTIC! Oh my this game rocks. It is visually beautiful, the music blew me away, lots to download and keep, lots of wallpapers and 3 screensavers, lots to collect, cool achievements. I love that they use real actors for scenes, they included voice overs which were very good. I give this game 5 stars all the way! Deff buying the collectors edition! Rated 5 out of 5 by esteroverde from Best Ever Fear For Sale! This was absolutely the best of the series. From the beginning the opening scene was remarkably real looking and the voiceovers are very well done. Even the background music was appropriate. Storyline is great to follow along with. HOS are very clear and interactive. Mini games are very good as well. So much to collect with morphing objects and different categories of collectable items. Achievements to be earned as well. This is a great CE packed full of things to keep you busy and interested. A definite buy for me! Rated 5 out of 5 by laylamaeplays from Pleasantly Surprised! I must admit, I was skeptical when I first saw that this was about 'phantom water'. Even more skeptical of purchasing this game before trying however, I was bored and it was featured. When I first started playing I knew immediately that I was going to like it a lot. There are quite a few of those annoying HO scenes (no offense to anyone who enjoys HOS, just not my thing) but I really didn't mind them in this game. They were very clear, yet some things are cleverly hidden. The best part about the HO scenes in this game is that you can opt out and piece together jigsaw puzzles instead! I love jigsaw puzzles so this was right up my alley. When you find the bonus objects you get 'experience' points, which is something new and different. There are also different bonus object collections. Story progresses at a quick rate and that is a BIG plus for me. I hate to be stuck in the same spot for very long. I'm not going to say a whole lot more as I haven't finished the game yet. I just couldn't wait to review this game and that never happens with me. I had to force myself to stop playing a few minutes ago to go to bed. IMHO, definitely worth the $$. Get it!! PS- Graphics are beautiful. Some of the best I have seen lately. Rated 5 out of 5 by Anne69_ from AWESOME GAME!!!!! Bought this game without trying the demo and wasnt disappointed. Elefun is one of my favourite developers and I have enjoyed the other ones in the series. Glad to see they are sticking to a tried and tested format when your on a good thing why change it. Good graphics, nice story, keep them coming. Rated 5 out of 5 by MSBAM100 from Water, water everywhere! This is the fourth in the Fear for Sale series, and it is great fun! You are paranormal journalist Emma Roberts, who is summoned by Adrian White because water is pouring out of everywhere in his home. His wife Julie, a PHD researcher, was recently killed when a bomb exploded in her research boat. Right before she died, she noticed something amiss near the dam. You arrive at the White's, turn off the water, solve the puzzle and rescue Adrian from the basement full of water. You earn a special shell that can manipulate water. It drains the basement, puts out fires, does lots of water-related things. You also find a map to help you. The HOS are all lists, and the mini-games are not necessarily unique, except for the water theme. The voice-overs, especially daughter Katie, are great. There is a suspicious mine owner you find at Julie's lab, so I am sure he's involved in her death. There are achievements, plus 7 collections of 6 objects each -- afternoon tea, dolls, conch shells and more. And 36 morphing objects! Plus the normal CE Bling, bonus chapter and strategy guide. These games are all interesting and fun. Try it yourself and see! Rated 5 out of 5 by biscuitsmama from Another Excellent Fear for Sale Game We play the game as Emma Roberts who investigates paranormal activity and now we have been called upon by Adrian White whose wife Julia was recently killed in a tragic boating accident to help him find out what is happening in and around his home. The water at Adrian’s home seems to have a life of its own and is out of control with water dripping from the walls and pictures in his home. He implores us to help him find out what is causing this terrifying activity. Shortly after we meet with Adrian he is swept away by a wall of water and locked in his basement, now this is where our investigation and the fun begin. Will we be able to solve the mystery of Julia’s death and discover what she is trying to tell us? The graphics are generally very good but appear slightly grainy and lack the crisp clarity of some other games by this developer. The previous Fear for Sale Nightmare Cinema was a game with excellent crisp graphics but unfortunately that graphics quality seems to be missing from the current game. In this installment of Fear for Sale, the game uses live actors as well as animated or computerized characters so there are lip-synced voice overs which I always like in a game. The sound package is excellent and I didn’t find the music to be intrusive or annoying except when I clicked on the Extras section and the music was horrible. Thank goodness that didn't carry over into the game. As far as tools we have a diary that contains our objectives as well as notes that will help us as we progress on our adventure. We also have an interactive transporter map that indicates where we have tasks to accomplish. Another unique tool is acquired shortly into the game and I have found it to be quite helpful when confronted by a soggy situation. I find the seashell adds a new dimension to what we usually do with our “helpers”. All of the HOPs, during the demo at least, were the standard interactive list type and I must say that they were generally piles of junk and that made it difficult to discern the objects to find. If we choose not to look through the piles of stuff, we do have the option to complete a jigsaw puzzle instead – one of my favorite options. As far as the puzzles in the game are concerned none of them are too difficult and some are downright simple. 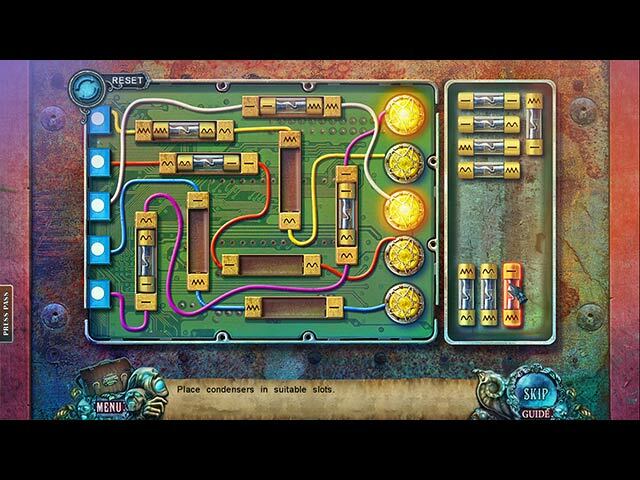 Alas, I guess the new trend in HOPA games is for overly simple puzzles so that the developer doesn’t frustrate those gamers who like easy and don’t want the challenge of solving a difficult puzzle. I wish the devs would include more challenging puzzles in their games because there is always the “skip” option for those who just can’t handle the challenge. IMHO, we finally have a CE game that is really what I consider CE worthy and justifies the added cost. Fear for Sale Phantom Tide is a game that is fairly loaded with extras that almost borders on overload. 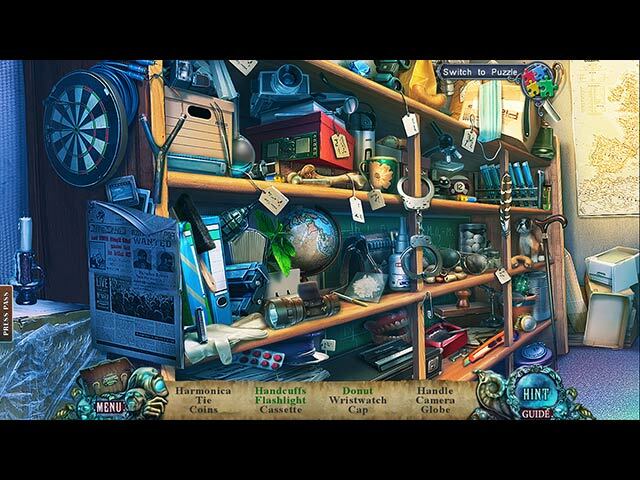 We have morphing or beyond objects to find and several collections, each of which has five different objects to locate. Throw in the achievements that are earned during the course of gameplay and we have a CE game that is full of the things that are sure to keep us busy for several hours and challenge us as we make our way through the games. In conclusion, Fear for Sale Phantom Tide is a solid five-star game and so entertaining that when the demo ended I was surprised because I was so absorbed in the storyline. This is definitely a CE game that I look forward to adding to my game collection and I might add that it is one of those games that I can see myself replaying. As always, I recommend that you at least try the demo to see if this is a game you will like.